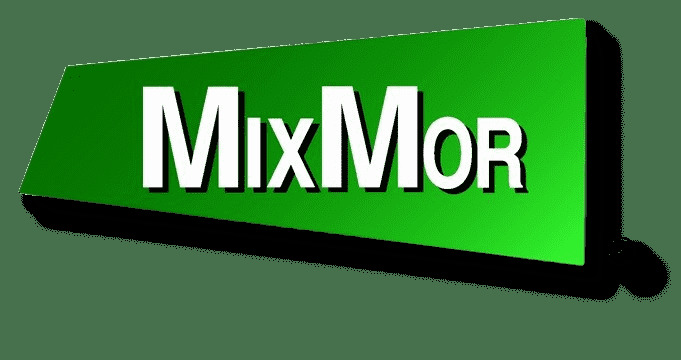 MixMor Offers high quality, heavy duty portable mixers ranging from 1/4 to 5 horsepower. With shaft diameters from 5/8" through 1-1/4", we can handle even the toughest products. * see table below for specifications on the individual mixers. 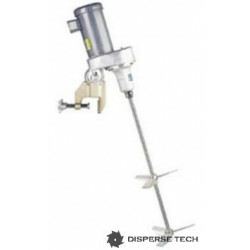 MixMor heavy duty gear drive mixers use standard NEMA C face motors mounted on aluminum gear drive housings. Housings enclose helical gears with a double sealed ball bearing with upper and lower seals for or additional protection. Reducers are grease lubricated for life. Mixer mounts with a heavy duty brass clamp with handwheels for fastening, thus eliminating the need for special tools or wrenches. The clamp and drive housing have a ball and socket assembly to allow 360 rotation on the horizontal plane and 100 on the vertical plane for optimum shaft angle. Variable Speed Drives: Available with Inverter, AC variable frequency or Accumix® SCR/DC drives in NEMA 1 or 4 enclosures. Housings: Aluminum alloy housings with heavy duty, corrosion resistant brass clamps. 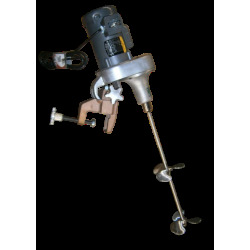 Available in stainless steel or other alloys. Impeller Speeds: Gear Drive 230, 290, 350 or 420 rpm. 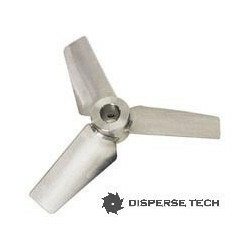 Impellers: Marine Props, hydrofoils, pitched and flat blade turbines, and dispersion blades are available. Contact us with your requirements, we would be happy to prepare a suitable design for your application.